Marius Rakotondratsima is a Malagasy conservation biologist. He graduated from the University of Antananarivo with a DEA degree in Animal Biology, Ecology and Environment in 1995, and from Kent University with a MSc in Conservation Biology in 1997. He conducted lemur surveys at two protected areas for Wildlife Conservation Society at Masoala National Park and Sahamalaza National Park in northern Madagascar. His specific focus was on monitoring lemurs and the impact of human disturbances and hurricanes on the lemur population in Masoala National Park. He joined The Peregrine Fund in 2005 as scientific coordinator at The Peregrine Fund's Madagascar Project. He supervises the technical and scientific aspects of the project implementation. He also assists the Madagascar’s Project national director in the global orientation of the project, proposals, scientific meetings and on technical reports and papers. He is interested in the applications of advanced GIS in biodiversity conservation, following consecutive training and international conferences he has attended at ESRI Redlands USA in 2001 and 2006, in Antananarivo, Madagascar in 2003, and from the WCS GIS training program in Kenya in 2002. 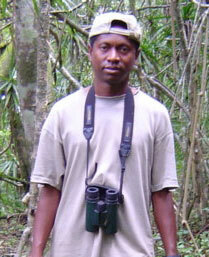 In 2006, he assisted in the country-wide survey of the Madagascar Harrier. Currently, he is investigating the impacts of the forest fragmentation in bird communities and the conservation implications for his doctoral degree and University of Antananarivo, Madagascar. One of his main responsibilities is coordinating the creation of three new protected areas for the Madagascar Project for the critically endangered Madagascar Fish Eagle and Madagascar Pochard. He is also interested in assisting in local community involvement in biodiversity conservation and natural resources and protected area management.